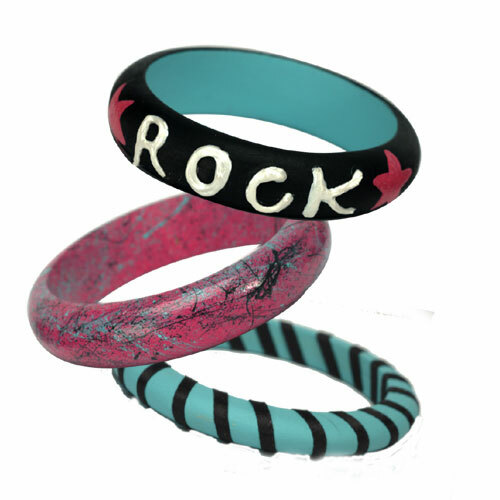 Even if you don't party like a rock star, you can dress like one with these rocking bracelets. 1. Using flat brush, paint inside of bracelet Bahama Blue. Paint outside Lamp Black. Let dry. 2. With pencil, lightly write ROCK on bracelet along with two freehand stars to right and left. 3. Using liner brush, paint stars Royal Fuchsia. Let dry. 4. Use White Americana Writer to outline penciled word. Let dry. 5. Seal with Multi-Purpose Sealer and let dry. 1. Using flat brush, paint entire bracelet Royal Fuchsia. Let dry. 2. Load old toothbrush with Bahama Blue.Use finger to flick paint off of bristles onto bracelet. Clean toothbrush and load with Lamp Black and repeat. Let dry. 3. Use flat brush to apply coating of Triple Thick Gloss Glaze. Let dry. 1. Paint bracelet Bahama Blue. Let dry. 2. Seal with Multi-Purpose Sealer and let dry. 3. Using glue gun, glue end of ribbon to inside of bracelet. Wrap diagonally around bracelet and glue again back at starting point. Use free-standing rod or ornament hanger to hang bracelets while drying. all i see are directions to enhance the appearance of the bracelets. no were in these direction do i see how you make the bracelets itself. what do you do with the bristle end of the toothbrush? how do you turn a straight piece of plastic into the round and work the ends, in to the bracelet so it is a closed circle and be a perfectly round bracelet that you show in the picture already made and ready to follow the instructions on the page to make them beautiful.